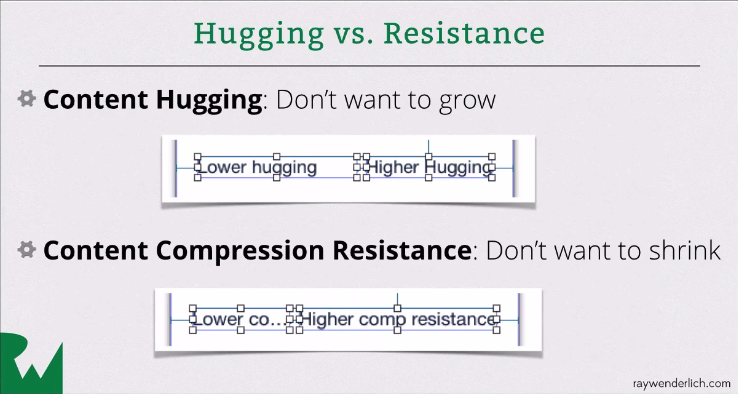 I can't find a clear answer on Apple documentation regarding Cocoa Autolayout about the difference between content hugging and compression resistance. Can somebody explain their usages and difference ? and you've pinned the edges to a larger superview with priority 500. If it doesn't work like this then you've probably got some other constraints going on that are messing up your good work! Intrinsic Content Size - Pretty self-explanatory, but views with variable content are aware of how big their content is and describe their content's size through this property. Some obvious examples of views that have intrinsic content sizes are UIImageViews, UILabels, UIButtons. 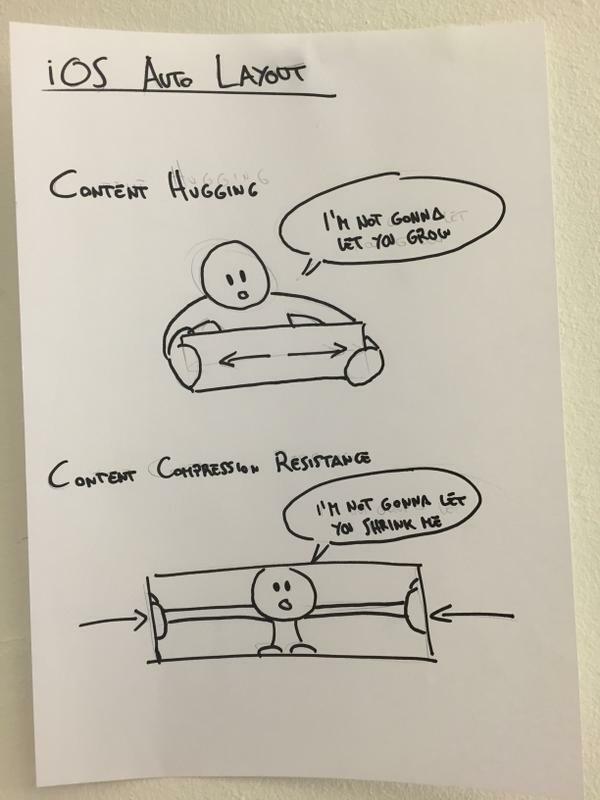 Content Hugging Priority - The higher this priority is, the more a view resists growing larger than its intrinsic content size. Content Compression Resistance Priority - The higher this priority is, the more a view resists shrinking smaller than its intrinsic content size. Let's say you have a button with the text, "Click Me". What width should that button be? First, you definitely don't want the button to be smaller than the text. Otherwise, the text would be clipped. This is the horizontal compression resistance priority. Second, you don't want the button to be bigger than it needs to be. A button that looked like this, [ Click Me ], is obviously too big. You want the button to "hug" its contents without too much padding. This is the horizontal content hugging priority. For a button, it isn't as strong as the horizontal compression resistance priority. a constraint requiring view.width >= view.intrinsicContentSize.width with the horizontal compression resistance priority. Content Hugging and Content Compression Resistence Priorities work for elements which can calculate their size intrinsically depending upon the contents which are coming in. And the Content Compression Resistance is, how much a view "resists" getting smaller The View with higher resistance priority value is the one that will resist compression. Not the answer you're looking for? Browse other questions tagged cocoa autolayout or ask your own question. 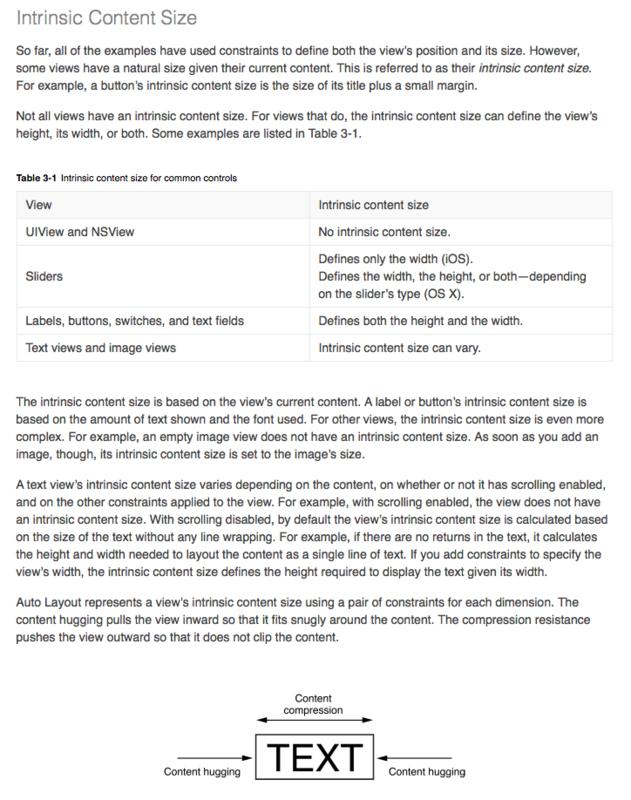 What is the content compression resistance and content hugging of a UIView? UITableView cells have content hugging and compression resistance properties without constraints? iOS, Autolayout derives height, not sure how? Content compression resistance priority, value 48 meaning?